The wonderful Zipessa kicked off a fine weekend of action for Exhale Bloodstock, when she finished third in the GI Beverly D Stakes at Arlington. A $67,000 yearling purchase by Marette Farrell from the St. George Sales consignment at the Fasig-Tipton Kentucky fall yearling sale, Zipessa pulled out all the stops for owners Empyrean Stables and trainer Mike Stidham. A race of this stature looks well within her grasp. 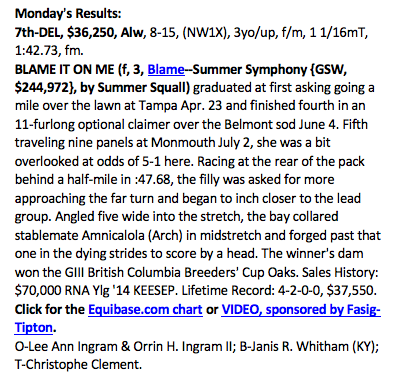 Yearling purchase Blame It On Me, a three-year-old filly by Blame, won her second race Monday for owners Lee Ann and Orrin Ingram, and trainer Christophe Clement. Congratulations to winning connections with this lovely prospect!